Enjoy a Hong Kong shore excursion complete with a ful-day sightseeing tour that hits all the hot spots in Hong Kong Island and Kowloon. Follow your expert guide through the most famous landmarks and gain an insider’s understanding into what makes this destination so unique. Hop aboard the Star Ferry and enjoy a ride across Victoria Harbour. 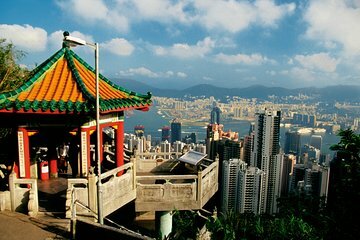 Opt for a traditional sampan ride through the floating village of Aberdeen and ride a tram to the top of Victoria Peak. Enjoy free time to explore and shop at your leisure at the area’s most popular local markets. Kick off this full-day sightseeing tour of Hong Kong with a ride across Victoria Harbour on the famed Star Ferry. This popular attraction transports some 70,000 people across the waters of Hong Kong each day and has been in operation for more than a century. Make your way to the Central district after your morning cruise and travel in the air-conditioned comfort a coach bus past Repulse Bay. Arrive at Aberdeen Harbour, best known for its floating fishing villages. Ride a sampan around the harbor and learn from your expert guide about this unique community as you get a closer look. From the village, stop at a local jewelry factory to see how expert craftsmen make stunning adornments using gold and gems. Then head to Stanley Market, where you’ll have the chance to shop for incredible deals and unique delights during a bit of free time. Enjoy a local lunch (at additional cost) before continuing on with this full-day shore excursion adventure. Ride the Victoria Peak tramp—a short funicular railway that ends at Lion’s Pavillion, where you’re met with incredible views of the harbor and city skylines. Make one final stop at the Mongkok District in Kowloon, where you’ll interact with locals at the Ladies Street Market before being dropped back at your ship in the Hong Kong port. We will ensure your timely return to the Hong Kong cruise port for this activity. In the rare event your ship has departed, we will arrange for transportation to the next port-of-call. If your ship is delayed and you are unable to attend this activity, your money will be refunded. See our terms and conditions for full details. Shuman was a wonderful guide. We had a nice small group, but wanted to see Hong Kong. The stop at the jewelry shop left us frustrated that we were held hostage to listen to a presentation and ushered into a showroom to buy stuff. We saw other tour groups from a cruise ship there too. Cut this part out and allow more time for the guest to shop and see the sights of the city. On August 31 we had a wonderful tour of Shanghai. Our tour guide was Lily. She is a delight! She is extremely knowledgable and thorough. Lily is extremely flexible and her commentary throughout the tour was extremely interesting. Her's was the best tour of the four we took during our trip. If you are going to take a tour in Shanghai, my wife and I urge you to seek her out. You won't be disappointed! Good tour. Great tour guide. This was a great tour. We were picked up at the port and went via a mini-van. Our guide spoke very good English and explained the sights of the city. Hong Kong was a very delightful experience. Notably because we had not traveled to this part of the world before. Our excursion was on the Tramway ascending to the sky and reaching a wonderful area to see a larger than life Budha. To heighten the experience we did see two bulls searching for food in a crowd. I took this tour a shore excursion instead of the one offered by my cruise line. I booked on ship and was quite satisfied. They picked up at the cruise terminal on time and he was able to get all off us out in a timely fashion. Loved the great photo ops while on the sampan and at Victoria Peak. Just did not like some of the shopping location ladies market too crowded and hard to find guide and gem store presentation first thing. Other then that I would highly recommend tour as these were some of the best pictures and moments in Hong Kong. Great tour guide, very knowledgeable. I would suggest a small lunch be offered as your competitors do for this price. Very good tour and well organized. The tour picked us up right at the cruise port and brought us back right on time.